Have you ever had the chance to feel alpaca fiber? It’s incredibly soft and is often compared to cashmere because of its extremely plush texture. It can also provide you with as much warmth as wool does, but it doesn’t feel nearly as heavy as wool. Additionally, alpaca comes in more than a dozen natural colors and can be dyed to be just about any color that you want. It’s why so many people are turning to alpaca over other fibers. Here are some of the other excellent benefits of it. Alpaca fiber is so plush and so warm that you might not think that it’s all that breathable. But when you feel it against your skin for the first time, you will quickly realize that it has superior breathability. It can also wick body moisture away from your skin and provide warmth to you when it’s wet. It’s windproof and fire resistant. When you are wearing something made out of alpaca fiber, it will cut down on the wind that you feel. You also won’t ever have to worry about alpaca fiber catching on fire as it is naturally fire resistant. It also resists stains and acquired odors. There isn’t much that can change the look and feel of alpaca fiber. Many people are concerned about the allergic reactions they might have to using a product made out of alpaca fiber. But unlike other types of fiber, alpaca fiber is hypoallergenic and won’t cause those with allergies to struggle to be around it. It’s less irritating to the skin. There are lots of fibers out there, especially fibers that are very plush like alpaca fiber, that will irritate your skin when they come into contact with it. But that isn’t the case with alpaca fiber. It contains no lanolin and isn’t prickly at all, so you will feel nothing but softness when you are using something with alpaca fiber in it. 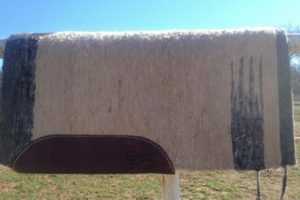 Cutter Classics Blankets understands all of the benefits of alpaca fiber and used them to create alpaca pads that can be used in conjunction with our alpaca blankets to ride horses. When you use our alpaca products, you will be provided with the smoothest, most comfortable ride you’ve ever taken, and your horse will appreciate the pad and blanket you are using. To learn more about our pads and blankets or to order one for yourself, call us at 580-276-6126 today.